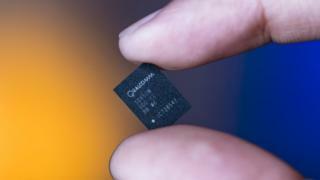 US President Donald Trump has blocked a planned takeover of chipmaker Qualcomm by Singapore-based rival Broadcom on grounds of national security. His order cited "credible evidence" that the proposed $140bn (£100bn) deal "threatens to impair the national security of the US". There were concerns the takeover could have led to China pulling ahead in the development of 5G wireless technology. The deal would have been the biggest technology sector takeover on record. A takeover of Qualcomm by Broadcom would have created the world's third-largest maker of microchips, behind Intel and Samsung. The chipmaking sector is in a race to develop chips for the latest 5G wireless technology and Qualcomm is considered to be a leader in this field, followed by Broadcom and China's telecoms giant Huawei. Analysts say Qualcomm is highly regarded for its commitment to research and development (R&D), particularly in the field of 5G technology. Huawei is equally committed to R&D in the area. However, Broadcom is better known for selling assets and growing through acquisitions, and deemed to be weaker on R&D. With this in mind, analysts have said a deal between Qualcomm and Broadcom could have given Huawei the chance to take over the top spot in years to come - a situation US politicians wanted to prevent given their ongoing security concerns around Chinese telecom firms doing business with US carriers. Others have said Mr Trump's decision was more about competitiveness than security concerns. "Given the current political climate in the US and other regions around the world, everyone is taking a more conservative view on mergers and acquisitions and protecting their own domains," said Mario Morales, vice president of enabling technologies and semiconductors at global research firm IDC. "We are all at the start of a race, and you have 5G as a crown jewel that everyone wants to participate in - and every region is racing towards that," he told the BBC. "Semiconductor technology and companies like Qualcomm will be an important weapon in that 5G arms race [and] the US like other nations and regions want to be first." Is there a pattern emerging in President Trump's use of national security concerns as an international economic weapon? Perhaps, but his predecessor, Barack Obama did use the issue to block takeovers, including a technology acquisition attempted by a Chinese investment fund. The would-be acquirer in the current case is not Chinese, but the concern expressed by the Committee on Foreign Investment was about creating space for an increased Chinese presence in 5G wireless technology. Mr Trump has also invoked security concerns in slapping new tariffs on imported steel and aluminium. There are plenty of people who don't believe it. The EU's Trade Commissioner Cecilia Malmström called it a "safeguard in disguise" - a response to a surge in imports that affects a country's own industry. Mr Trump's willingness to grant exemptions, partly on the basis of what he sees as a fair trade relationship with the US, is consistent with the idea that it's not just about security. Broadcom said it was reviewing the order and "strongly disagrees that its proposed acquisition of Qualcomm raises any national security concerns". The company had been pursuing San Diego-based Qualcomm for about four months. Last week, however, Broadcom's hostile takeover bid was put under investigation by the Committee on Foreign Investment in the US (CFIUS), a multi-agency body led by the US Treasury Department. The US company had rejected approaches from its rival on the grounds that the offer undervalued the business, and also that any takeover would face antitrust hurdles. Earlier this year, Chinese telecoms giant Huawei said it had not been able to strike a deal to sell its new smartphone via a US carrier, widely believed to be AT&T. The US also recently blocked the $1.2bn sale of money transfer firm Moneygram to China's Ant Financial, the digital payments arm of Alibaba.